TechSoft have always been able to offer masses of options for Textiles teachers. Our CNC knife-cutters are ideal for bespoke ‘applied’ graphics and many teachers have discovered the fantastic opportunities that laser cutting and engraving has for textile materials. In more recent years, TechSoft have enhanced their product range with sublimation printing systems and, in particular, have developed a close relationship with Brother to supply high quality sewing and computerised embroidery machines. All the products have been carefully chosen to offer schools student friendly products that will give years of dependable service. Demand for our CAD/CAM for Textiles courses has grown and feedback from delegates has clearly shown the need for a one-stop-shop where teachers can go for the latest products, all the right consumables, the best advice and inspiration for developing new project ideas. Now, for 2015, it is here. Heidi Ambrose-Brown joined the TechSoft team in 2013 and has brought her considerable experience and in-depth knowledge to bear on what we can offer to textiles teachers. Heidi has a strong reputation for her inspirational Training courses and works at a national level to help shape the future of Textiles for D&T and within Art and Design education. Our new Textiles Product Guide distils Heidi’s experience into a broad range of TechSoft CAD/CAM and traditional products that have direct relevance to Textiles teachers. Importantly, everything is backed by masses of sample projects and (sometimes hard to find) consumables that will save teachers time and money when launching new ideas and techniques in the classroom. 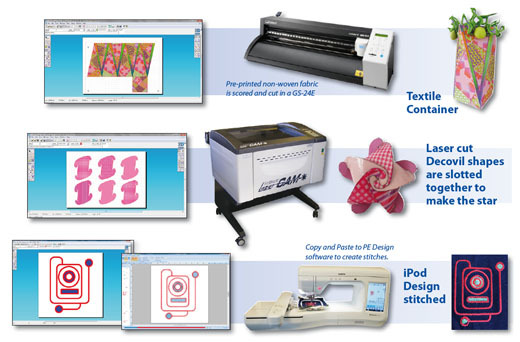 Prices are specifically for education and many products are exclusive to TechSoft - including some fantastic deals on Brother software for computerised embroidery. Students need the right creative tools and (for computerised output) this means CAD software. Some think that 2D Design is just about ‘technical drawing’ so has little application in Textiles – nothing could be further from the truth! 2D Design is the most comprehensive package available for all forms of CAD design including vector drawing for cutting out shapes, to image and pattern design for printing and engraving. Heidi’s example work makes full use of 2D Design and shows how Textiles teachers can make use of an ideal software platform that is probably already on-site. This means most textiles teachers can exploit prior learning in other areas of D & T and will, in effect, have unlimited on-site access for free. If older students need to use industry-specific software then 2D Design will still give them the most direct and hassle-free route for output to any CAM device. 2D Design imports and exports files in most common formats so can remain a key CAD/CAM resource for Textiles.